My daughter and I are reading the same book. It happened completely by accident. She had a book. She left it lying on the kitchen counter. I spilled grape juice on it. While I was cleaning it up, I happened to read a few lines of the book and suddenly I was hooked. I must have stood at the counter, sponge in one hand, book in the other for 20 minutes before my daughter came in looking for her book and made me give it up. Bad news: The book was a library book and it now was definitely tinted purple on a bunch of pages. More bad news: My daughter cried when she saw the state of the book. Good news: The damage meant that I had to buy the book from the library which meant that I could finish reading it. My daughter and I both continued reading the book and as we did we would discuss what was going on. It was pretty interesting to get her take on things and I discovered that what she thought was the most exciting or most important parts of the book were not the same as what I considered the best parts. When we were both done with the book, I was disappointed. I wanted that same connection to keep going. Luckily, the book was the first in a series, and a few days later, my daughter brought home book 2. And that is where our unofficial but very satisfying ongoing father-daughter book club began. 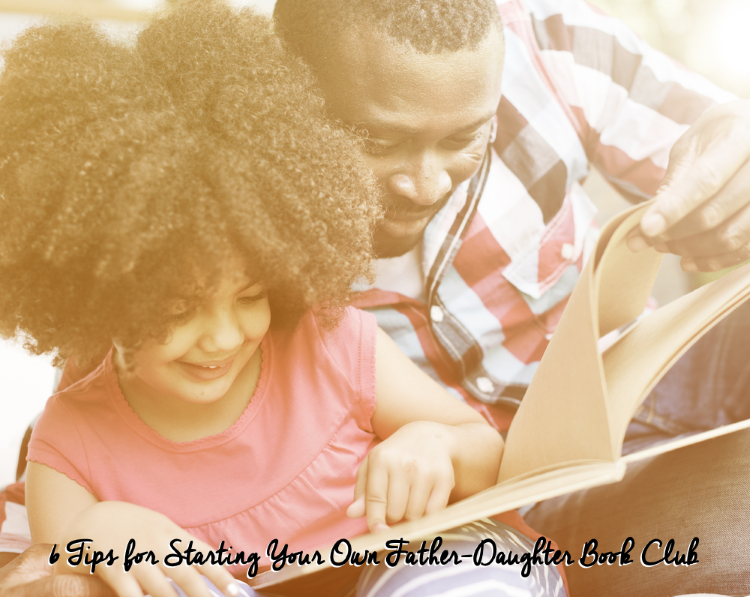 Want to get your own Father-Daughter (or Father-Son, for that matter) Book Club going? Here are few tips and tricks I’ve learned along the way that might help make it easier and more enjoyable for everyone involved. Let her pick the book. Trust me on this. You may have a favorite book that you remember from when you were a kid, but if you suggest it, your child will not want to read it and if by some chance they do (or pretend to) they will tell you how much they hate it, totally ruining the experience for you. Yep, I’ve been there. Resist the urge to pick the book, it’s just not worth it. Provide snacks. Sitting down with your child across an empty (or mostly empty table) is OK, but add some chips and salsa and it’s an invitation to dig deep into the story and spend quality time together. Invite friends. If your other kids want to join or your daughter has friends who want to be part of the discussion, let them. As long as they’ve read the book and have something to contribute, your conversation will be so much more interesting with multiple points of view. Go there. Don’t be afraid to broach difficult topics. Books for kids often touch on controversial themes (which is why so many of them get banned!) but if your daughter isn’t going to discuss death or prejudice or boys with you, who is she going to talk about these things with? Give your honest opinion. If you didn’t like the book, say so. If you did like it, say that too. And back it up with reasons why. Expect your daughter to do the same. It’s incredibly important for your daughter to understand that she is entitled to her own opinion and that her opinion is valid even if it differs from yours. Discuss, don’t quiz. A lot of books come with book club type questions in the back these days. Ignore those. I’ve found it so much more rewarding to have a conversation with my daughter about the book rather than quizzing her about what she read like they do at school. In fact, I think the reason we both enjoy our book club time together is that it doesn’t feel like school. It feels like hanging out with someone you really like who also read the same book you did. Don’t feel like you have enough time to read an entire book? Or perhaps your child isn’t quite ready to take on an entire novel? Why not try a short story instead? A well-written short story, like those found in CRICKET Magazine, contains all of the same elements of a good novel, including interesting characters, well-developed plots, and universal themes that will make for a great discussion. But with word counts much shorter than a traditional novel, you’ll both be able to get to the part where you learn more about your child much faster. By the way, that first book my daughter and I read together was called City of Ember by Jeanne DuPrau. I highly recommend it for all kids ages 9 and up (and their dads). If you see your child with this book, pick it up yourself and try it. Just watch out if you have a glass of grape juice in your hands.